This recipes is excerpted from my e-book “I Can’t Even With Pumpkin Spice: 21 Recipes Celebrating the Real Flavors of Fall.” Order it here! 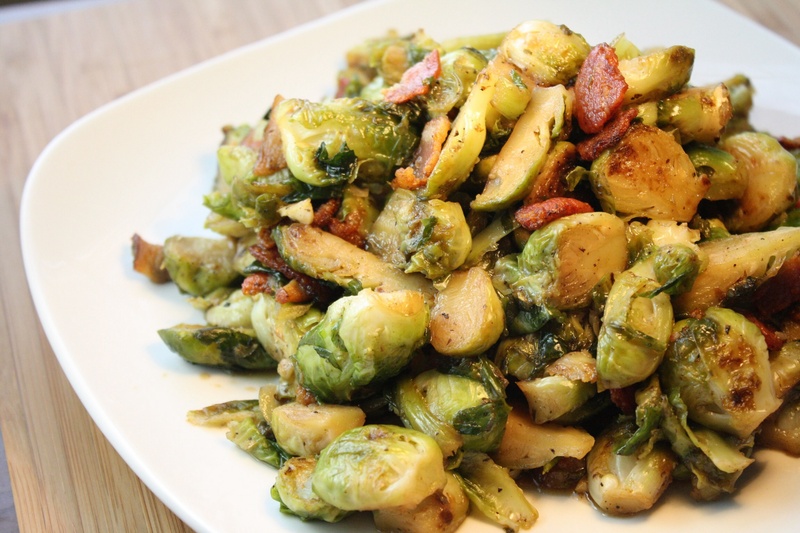 Give brussel sprouts a chance (especially braised brussel sprouts)! Forget about those soft, mushy, over-boiled blobs from your youth and give sprouts a grown up try. Whether you roast, steam, saute or braise them, brussel sprouts’ big flavor makes them a perfect cold weather side dish. Here’s what you need to know to cook brussel sprouts to perfection. First, brussel sprouts are a cruciferous vegetable, kissing cousins to cabbage, which explains their good looks. They’re chock full of vitamins A & C, iron, potassium and folate, which makes them even more attractive. Good sprouts come in small packages. Choose sprouts that are about 1 1/2 – 2 inches around. The leaves should be tightly packed and bright green. Before cooking, wash your sprouts, pat them dry and trim away the tough, woody stems. Peel away dull or yellowing leaves. I like to add a little sweetness to brussel sprouts to balance their robust flavor. A sprinkle of brown sugar or drizzle of honey or maple syrup will do the trick, but I find them equally delicious tossed with a little olive oil, sprinkled with salt and pepper and roasted to crispy bliss. Cooking brussel sprouts just until they’re done or fork tender is the key to avoiding the soft, mushy brussel sprouts no one ever loved. This recipe is a fantastic addition to your fall and winter table. The sprouts are first sauteed in bacon fat. I know. I know. I could stop right there and be in green veggie heaven, but just wait it gets better. Once the sprouts begin to soften and brown they’re braised in a mix of bourbon and chicken stock. I’m going to leave a couple of blank lines here to accommodate your applause. And if the bacon and bourbon aren’t enough. Once the sprouts are cooked to your liking — cook them longer for softer sprouts, less time for a bit more bite — stir in maple syrup until your sprouts are evenly coated. Sprinkle them with the crunchy bits of bacon and a fantastic side dish is served! Be sure to drain cooked bacon on a paper towel-lined plate to get rid of excess oil. Pour bourbon into center of the pan to prevent flare-ups. If your bourbon does flame up, don’t panic. The flame will die out as soon as the alcohol burns off. Cook bacon in a large sauté pan over medium high heat until brown. Use a slotted spoon to remove bacon from pan and set on paper towels to drain. Return pan to heat and add brussel sprouts. Cook, stirring occasionally, until brussel sprouts begin to brown, about 5 minutes. Add bourbon and chicken stock, using a wooden spoon to scrape any browned bits from the bottom of the pan. Reduce heat to simmer, cover pan and cook until sprouts are fork tender, 7-10 minutes. Remove lid and add maple syrup, stirring until sprouts are evenly coated. Sprinkle with bacon and serve. Breakfast, Recipes, Seriously? You Cooked That?